Within Teamwork Projects, you can quickly start a new timer no matter which part of your site you are currently in. Click the + to the right of the search bar to see the Quick Add menu options, and select Start Timer from the dropdown. 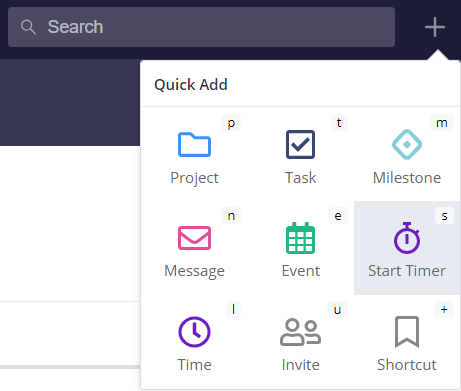 You can click the Start Timer option, or you can use our keyboard shortcuts by pressing q on your keyboard to bring up the menu then press s.
When you choose to start a timer using this menu option, you will need to pick which project you would like to log the time on. 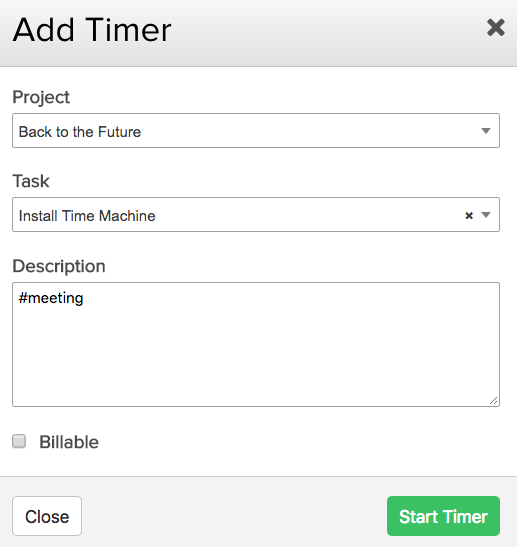 You will also have options to select an individual task, add a description, and mark the time as billable. Once a project has been selected, you can start the timer and it will run in the lower left corner of the screen. You can then log the time to the project when you are ready. Note: While you can have multiple timers active on the screen, you can only have one of these timers started or running at at a time. If you hover over a timer, it will show you the name of the associated project, task list and task.